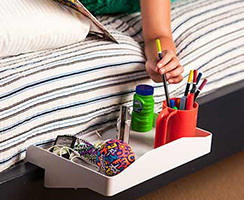 A tray that attaches to the side rails, foot board, or headboard of a bunk bed or loft. Attach to any frame up to 2 inches in width. Colleges and universities. 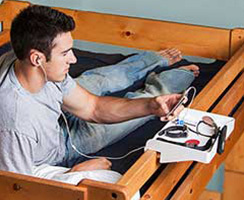 Can also be used in Day camps, sports camps, and any other overnight camps. 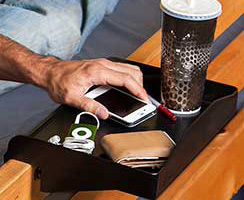 Easily and safely holds iPads, iPods, cell phones, Kindles, Nooks, Tablets, glasses, and many miscellaneous items. Fantastic and simple for use in children's rooms for bedtime items such as books, lights/lamps, water bottles, alarm clocks, and tissues. Adjusts easily with no tools! 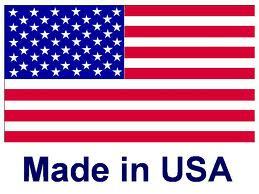 Fits most wood or steel bed frames up to 2" thick. Sturdy and Strong - Holds 15lbs level without tilting. Its dimensions are 9” x 13.5” with a 2” high edge to keep items from tipping off the back or sides. 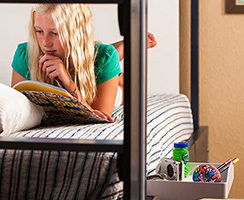 Keep up with Bunk Buddy!